Build phonemic awareness skills and letter/sound recognition with ready-to-go sound sorting kits. The wide variety of irresistible objects will actively engage young students in discriminating among similar sounds, and in connecting those sounds to the letters that represent them. 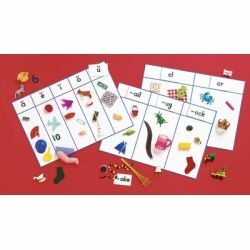 Each kit includes dozens of objects organized by individual sound, 4 two-sided sorting mats with 2, 3, 4, and 5 columns, header cards with target sound and illustration, and The Sound Sorting guidebook. 100 objects.